Today we are excited to be releasing Windows 10 Insider Preview Build 14946 for PC and Mobile to Windows Insiders in the Fast ring. 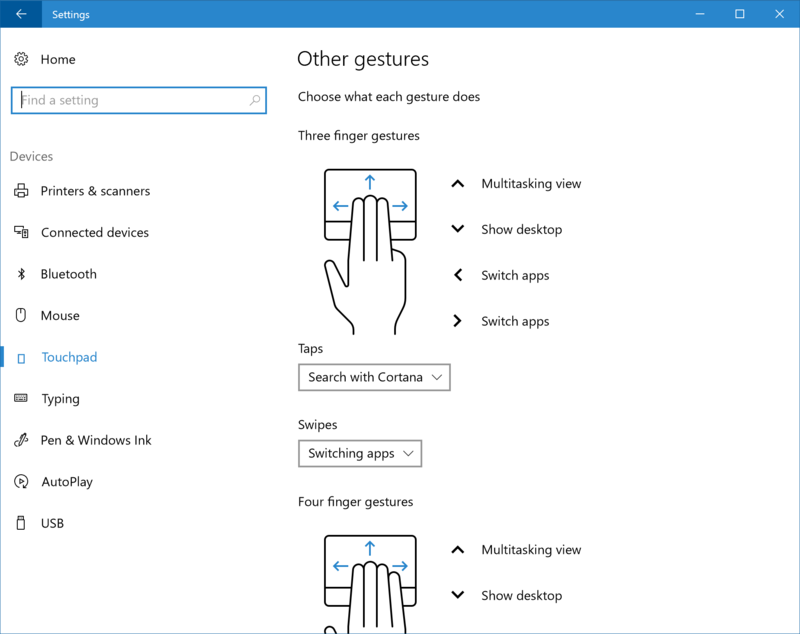 Known issues to look out for with your touchpad: since the last flight, we’ve fixed the issue resulting in touchpad scrolling being too sensitive in Windows 10 apps - appreciate everyone who shared their feedback on the subject. 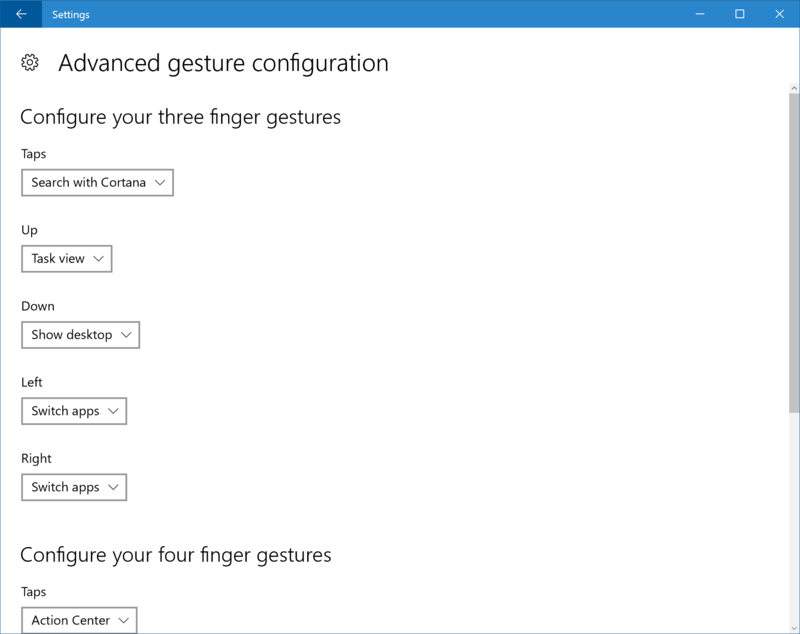 There’s one other known issue we’re looking into right now that click and drag with your precision touchpad might get misrecognized as right-click in this build. You’ll also notice that there’s a “custom keyboard shortcut” option in settings – that hasn’t lit up yet, but we’ll let you know when it does. Keep the feedback coming! Separate screen time-out settings when using Continuum for Phone (Mobile): Today, we are happy to announce the availability of a top user request for Continuum for Phone. With this update, you will now be able to turn off whichever screen you are not using with Continuum – saving battery and preventing screen burn-in. If you are working on a Word document, your phone screen will sleep without any impact on your Continuum session. If you make a call, hang-up, or press the phone power button, you can keep right on working in Word with Continuum. And, if you prefer longer or shorter timeout values, you can change them independently for the phone and connected screen, using the settings found under Settings > Personalization > Lock screen. Have fun, and keep sending us great feedback on Continuum! Updated Wi-Fi Settings page (PC and Mobile): We continue to make Settings more similar across Windows devices. We have added a new setting to the Wi-Fi settings page. 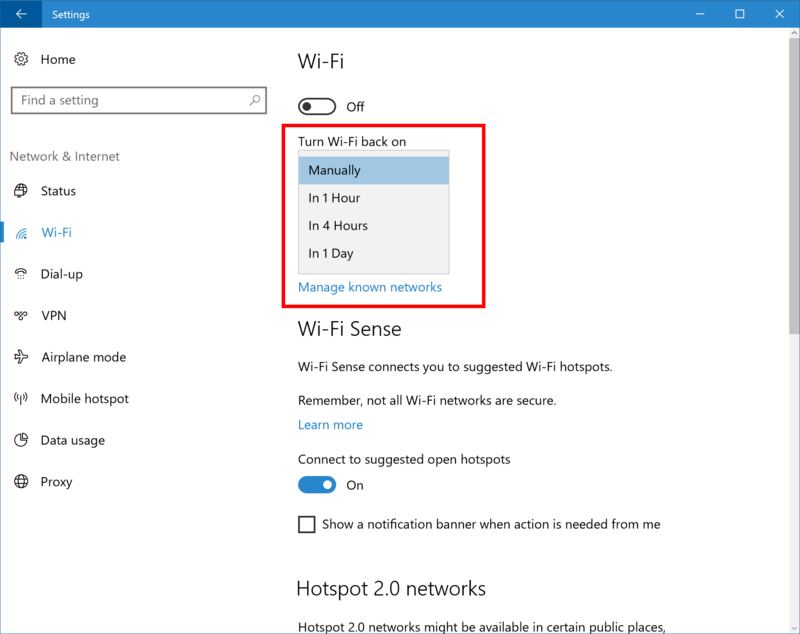 When you go to Settings > Network & Internet > Wi-Fi on your PC, then turn Wi-Fi off, you can now select a time under “Turn Wi-Fi back on” to have it turn on automatically after the amount of time you choose. It’s set to Manually by default in this build. Option to remove a word from user dictionary (Mobile): We learn from your typing on the phone and build up a local user dictionary that adapts the keyboard prediction, autocorrection and shape writing experiences to your language style. Sometimes you may type a misspelled word and send it as is, sometimes you may tap on a red squiggled word and then tap the “+” sign by accident. Both save the unwanted word into your user dictionary, and it may appear when you type something similar in the future. Now you have a way to manually remove bad entries: tap on the word you don’t like in the text box, and you will see a candidate that is the word with a “-“ sign before it. Tapping on that candidate will remove the word completely from your user dictionary and no longer suggest it. Important note about a change to automatic backups of your phone (Mobile): We have changed the frequency of scheduled backups for Mobile to once a week. Initiating a backup manually by clicking the “Back up now” button remains unchanged and works as expected. You can do this via Settings > Update & security > Backup and clicking the “More options” link at the bottom. As always, it’s good to do a backup of your device before updating to a new build. · We fixed the issue causing you to get into a state where text messages will fail to send. · When your phone is connected to your PC, long lists of captured photos will now load significantly faster in File Explorer. We fixed an issue resulting in video thumbnails sometimes not being shown in WhatsApp - videos received from this build onwards will display a thumbnail. · Going forward, any build from our Development Branch installed on a PC will be put into the Slow ring. This includes if you installed a Development Branch build from an ISO or later reset the device. · For PCs on the Windows 10 Anniversary Update that were previously opted in to receiving builds but see a "Fix me" button on the Windows Insider Program settings page because they no longer have a registered Microsoft account attached will be put in the Release Preview ring. If you would like to adjust these settings or suspend getting Development branch build updates temporarily (7 days), you can do so by going to Settings > Update & security > Windows Insider Program. To move to the Fast ring, a Windows Insider registered Microsoft Account must be attached to the PC. For enterprises running Insider Preview builds, you can manage this via these Group Policies documented here. Whew! On top of all the build and update system news, we also made a ton of progress on our #WINsiders4Good work for GIVE month. 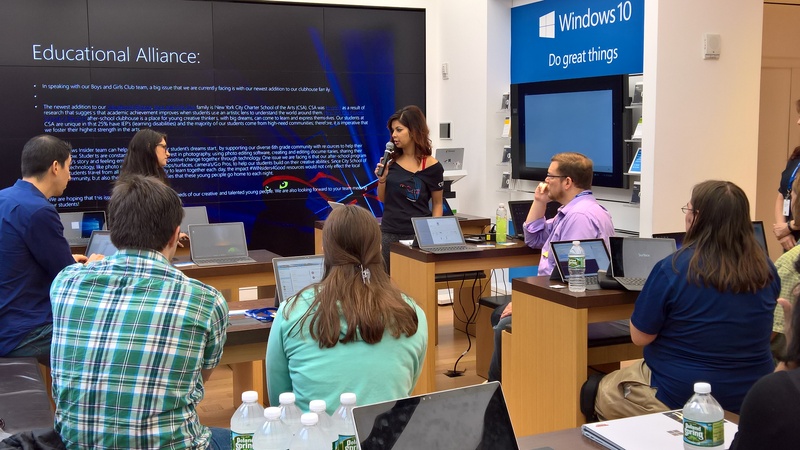 We had a fantastic launch of GIVE Month at the NYC Flagship Microsoft store last weekend where the Windows Insiders partnered with Educational Alliance to create solutions for after-school care for students from underrepresented backgrounds. The team came up with a variety of solutions, including some that are being completed with the help of the Windows Insiders globally. We are creating the world's biggest open source list of free software tools that NGO and everyone else can use to teach and to learn concepts such as visual design, coding, problems solving and more so that EVERY person can have access and knowledge to these great tools. . This webpage will live on our Windows Insiders website. I'll share more as it goes live before Friday. We are excited to be present at the Boston Microsoft store event this weekend as well as the global rollouts of the Create-A-Thon kits.